A longtime client of the firm was sued by a woman that did not live in the association who claimed that our client had illegally obstructed her view of a lake owned by our client association. After a jury trial on the sole cause of action that was left after we prevailed on a motion for summary adjudication knocking out all of her other frivolous claims, the jury decided that there was no spite fence. This result was not a surprise as the plaintiff was not entitled to her view of the lake, no matter how precious it was to her. Here are the facts: the plaintiff’s home bordered a park that the association owned and maintained and she was entitled to use the park. The park was between the plaintiff’s home and the lake, hundreds of feet separating her home from the lake. The park had been, at the time the plaintiff built her home, unimproved except for two 200 year old oak trees that partially obstructed her view. Otherwise, the park was made up of dirt and native grasses. Her neighbors wanted the park improved and prevailed upon the developer of the association to improve the park as was required by the development documents and the county. The plaintiff did enjoy a view of the association’s lake. But her view became obstructed several years later when the trees that the association’s developer planted grew up. The plaintiff’s property, while not part of the association, is part of a community association, which unlike the association that is our client, is not a mandatory membership community association. It is a voluntary association, formed to manage issues of the homes in and around the plaintiff’s home (which homes were built before the association was formed). The plaintiff acknowledged that there were no restrictions on the land that require that she be provided a view or that require that our client association provide the plaintiff with an unrestricted view of the lake. 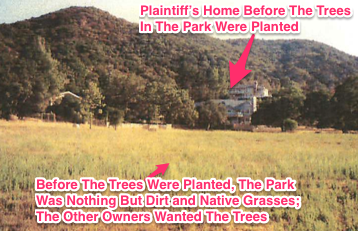 This lawsuit involved trees in the park that the plaintiff claimed constituted a “spite fence.” The trees in the park were not planted by the association; most of the landscaping and development of the park was completed by the association’s developer. The trees that the plaintiff complained were obstructing her view were installed in the park years before the park had been transferred to the association in 2005. She was suing the association for maintaining what she called a spite fence. One big problem she had was trying to prove malice. None of the association’s board members knew who she was or had any reason to want to spite or harm her. More importantly, none of the trees that the plaintiff complained were obstructing her view are on or near her property line, and as a matter of law, those trees were not a spite fence. It was undisputed that the plaintiff purchased her property and built a house upon it in 1996. The plaintiff admitted that approximately fifteen percent of her view was already blocked at the time she built her home by the two 200 year old protected oak trees. The plaintiff knew as early as 1999 that new/additional trees had been planted in the park, and complained because several of the trees were allegedly in her claimed viewshed. By 2005, the year the association took over the park, the plaintiff acknowledged that 25% of her view was purportedly obstructed. She claims that by 2006, 3/8ths of her view was purportedly obstructed. By 2007, she claims that 1/2 of her view was obstructed, and by 2008, 3/4ths of her view was obstructed, and by 2009, 100% of her view was purportedly obstructed. The association disputed the allegation that all of the plaintiff’s view of the lake has been completely obstructed, but did acknowledge that the trees in the park were obstructing the plaintiff’s view of the lake. While her view of the lake was obstructed most of the year, for at least 3 months of the year when the leaves were off the sycamores, she had some view of the lake. And she did have a great view of the park and trees. 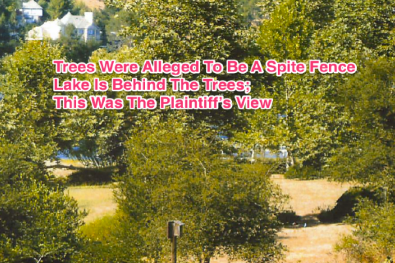 The trees were more then 300 feet from the plaintiff’s property line and cannot be considered a “spite fence.” While sympathetic to the plaintiff, the association is duty bound to maintain the park for the benefit of all of the many owners that live at the association and/or around the Lake, and the evidence showed that the vast majority of these other owners want the park as it is, with trees. And as the plaintiff was not the only owner that formerly had a largely unobstructed view of the lake, if the association were to accommodate the plaintiff and remove the five or more trees that she claims need to be removed to provide her with a view of the lake, the association would likely have to remove trees for the other 17 owners that were allegedly similarly situated. As a result, most of the trees would have to be removed. As the association had no legal obligation to provide the plaintiff with her unobstructed view of the lake, and as the trees are not on or near her property line, and as there was evidence that the primary intent for the trees is the aesthetics of the park and not to obstruct the plaintiff’s view, as established at trial, the plaintiff could not prove that the trees constitute a spite fence. To learn more about what a spite fence is and how it could be used as a claim against a homeowners association, follow this link to an article that we prepared that formed the basis of our trial brief in this case. After hearing all of the evidence, the jury’s verdict was in favor of the association. The jury found that there was a row of trees, but they did not find that the trees unnecessarily exceeded ten feet in height. We were talking about trees in a park, after all. Thus, there was no spite fence, and the case was over. A good result for the firm’s client. SwedelsonGottlieb senior partner David Swedelson tried the case to the jury. Senior associate Joan Lewis-Heard handled most of the pre-trial work and prepared the motions in limine which were granted, as well as the jury instructions and verdict forms. David Swedelson is a senior partner at SwedelsonGottlieb and heads up the firm’s litigation and trial team. He is a condo and HOA legal expert. He can be contacted via email at dcs@sghoalaw.com.